return again to the pool. We placed the traps with great care, fastening them strongly, and covering them with sand. Before setting the trap for an otter, both the hands of the person who sets it and the trap itself should be well washed and rubbed with sand, in order to take away the human scent as much as possible. After setting the trap, a small branch of a tree should be used to smooth the ground and obliterate all footmarks, and then dipping the branch in the water, the whole place should be well sprinkled, which generally does away with all marks of people having been about it. As otters invariably have some particular points at which they leave the water, it is easy to know where to place the trap. They do not, however, always hunt the same part of a stream, so the trapper must have some patience. After our traps had been set for two nights, we found, on going to them in the morning, that an otter had been caught, and by twisting the chain round the root of a tree had contrived to break it, and escape with the trap on its leg. I sent home for my retriever, who, from having been severely bitten by other otters, was very eager in pursuing them. We hunted up and down the burn for some time in vain; at last we found his track and that of the trap in the sand at a shallow place of the water. This encouraged us, and we renewed our search. At last, nearly a mile from where the trap had been set, the dog began to run up and down the bank, whining and showing evident symptoms of perceiving, or, as my old keeper called it, " feeling" the smell of the otter. He could not make out exactly where it was, till at last corning to a dead stop opposite a quantity of floating branches and roots that had collected at a turn of the water, he pointed for a moment, and then springing in, pulled out a large otter with the trap still on him. 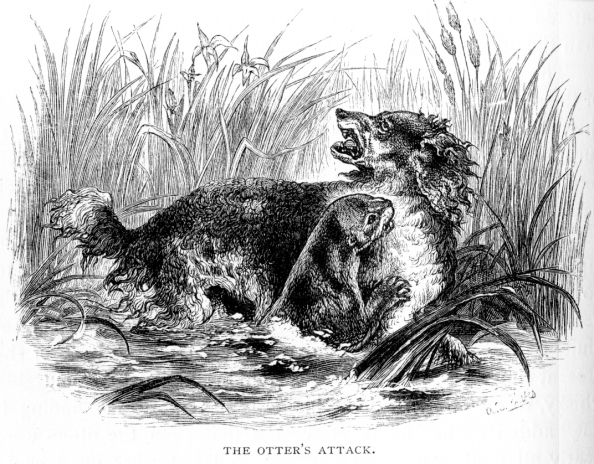 It was rather difficult to know whether the otter was bringing the dog, or the dog the otter, so vehemently did they fight and pull at each other; but we ran up, and soon put an end to the battle. The next morning I found another otter in the traps. Nothing could keep the dog from him; the moment he came within three hundred yards of the place he smelt him, and rushed off to attack him. A few nights afterwards, the moon being bright and the air quite still, my keeper determined to lay wait for the remaining otter. His track showed that he was a very large one, and he seemed too cunning for the traps. The man's plan was to make himself a 'small hiding place, opposite a shoal in the burn, where the otter must needs wade instead of swimming. We had come to the conviction from the tracks that the otters remained concealed during the day time a considerable way up the water, and hunted down the burn during the night to where it joined the river. It was a fine calm December night, with a full moon. The old man, wrapped in a plaid, and with a peculiar head-dress made of an old piece of drugget, which he always wore on occasions of this kind, took up his position at six o'clock. Before nine the otter was killed, having appeared, as he had calculated, on its way down to the river. This is one of the surest ways of killing this animal when he frequents a river or brook which in pasts is so shallow as to oblige the otter to show himself in his nightly travels. They appear to go a considerable distance, generally hunting down the stream, and returning up to their place of concealment before dawn. At certain places they seem to come to land every night, or, at any rate, every time that they pass that way. In solitary and undisturbed situations I have sometimes fallen in with the otter during the day. In a loch far on the hills, I have seen one raise itself half out of the water, take a steady look at me, and then sink gradually and quietly below the surface, appearing again at some distance, but next time showing only part of its head. At other times I have seen one floating down a stream with no exertion of its own which could attract notice; but passing with the current, showing only the top of its head and its nose, with its tail floating near the surface, and waving to and fro as if quite independent of all restraint from its owner. If he fancies that he is observed on these occasions, down he sinks to the bottom, where he lies quietly as long as he can do without air; and when obliged to rise to breathe, he comes up close to the bank, or amongst weeds, with 'only his nose above water. If, however, the water is clear, and you persist in watching him, and by quickly approaching him, oblige him constantly to dive, the poor beast will at last in sheer despair crawl out on the bank, concealing himself in the best manner he can. But it takes some time to oblige him to do this. Otters are very affectionate animals. If you shoot an old one who has young in the vicinity, they very soon appear searching anxiously for their mother; and if you kill the young ones, the parent will come boldly to the surface, and hover about the place till she is killed herself. When a pair of otters frequent a place, if one is killed, the other will hunt for its lost mate in the most persevering manner. If one is caught in a trap, the other remains all night near her, running round and round, in vain trying to get her away. Though usually so noiseless and quiet, on these occasions they make a great hubbub, blowing and snorting almost like a swimming horse. Sometimes they lie all day on some small island or bank covered with rushes, ready to slip down into the water on the approach of danger. I was one day in August looking for young wild ducks in a swamp covered with rushes and grass, when my dog, who was running and splashing through the shallow water, suddenly stood still, sometimes whining as if caught in a trap, and then biting furiously at something in the water. I could not imagine what had happened to him, and he either would not or could not come to me when called, so I waded over to see what was the matter. I found a large otter firmly holding on 'by his powerful jaws to the dog's shoulder, and had he not had a good covering of curly hair, I believe the brute would have broken his leg, so severe was the bite : even when I came up the otter seemed very little inclined to let go; but at last did so, and I shot him as he splashed away. When one of these animals is surprised in an open place, he will for some time trust to being concealed, remaining fiat on the ground, with his sharp little eyes, which are placed very high on the head, intently fixed on you. Like all other wild animals, he has an instinctive knowledge of how long he is unperceived, for the moment he sees that your eye is on him, he darts off, but not till then. During the winter many of the river and lake otters take to the coast, travelling a long way for this purpose, sometimes keeping the course of the streams, but occasionally going across the country. I have seen their tracks in places at a very great distance from water, where they evidently had been merely passing down to the sea. When on the coast, they frequent the caves and broken masses of rock. The otters that live wholly on the coast grow very large. It is easy to turn them out of their holes with terriers, as long as you remain quiet and unobserved by the otter yourself. If he once has found out that you are waiting to receive him at the mouth of his hole, he will fight to the last rather than leave it. I have been told that they bolt more readily to a white-coloured dog than to any other. All courageous dogs who have been once entered at otters, hunt them with more eagerness and animosity than they do any other kind of vermin. The otters here are very fond of searching the shallow pools of the sea at the mouth of the river for flounders, and I often find their tracks, where they have evidently been so employed. If surprised by the daylight appearing too soon to admit of their returning to their usual haunts, they will lie up in any broken bank, furze bush, or other place of concealment. At some of the falls of the Findhorn, where the river runs so rapidly that they cannot stem it, they have to leave the water to go across the ground; and in these places they have regularly beaten tracks. I was rather amused at an old woman living at Sluie, on the Findhorn, who, complaining of the hardness of the present times, when "a puir body couldna get a drop smuggled whisky, or shot a rae without his lordship's sportsman finding it out," added to her list of grievances that even the otters were nearly all gone, "puir beasties." "Well, but what good could the otters do you?" I asked her. "Good, your honour? why scarcely a morn came but they left a bonny grilse on the scarp down yonder, and the vennison was none the waur of the bit the puir beasts eat themselves." The people here call every eatable animal, fish, flesh, or fowl, venison, or as they pronounce it, "vennison." For instance, they tell you that the snipes are "good vennison," or that the trout are not good "vennison" in the winter. 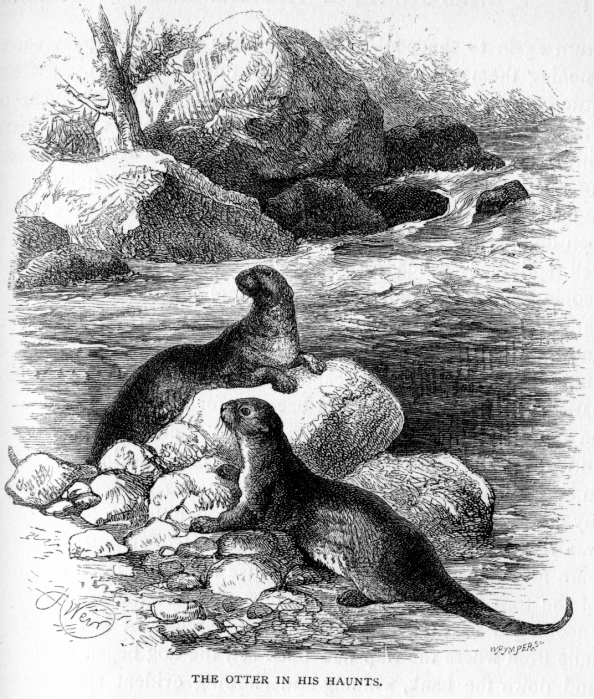 It seems that a few years ago, before the otters had been so much destroyed, the people on particular parts of the river were never at a loss for salmon, as the otters always take them ashore, and generally to the same bank or rock, and when the fish are plenty, they only eat a small piece out of the shoulder of each, leaving the rest. The cottagers, aware of this, were in the habit of looking every morning for these remains.